Our team hosts a variety of events throughout the year, and we welcome new guests and our loyal friends. 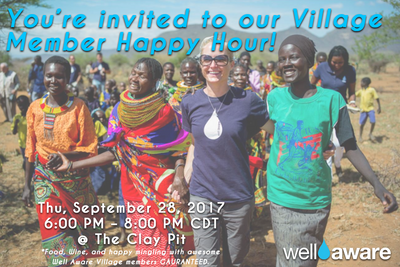 Join Well Aware on Monday, April 29th to celebrate our 11th Annual Shower Strike and providing more people with sustainable clean water! 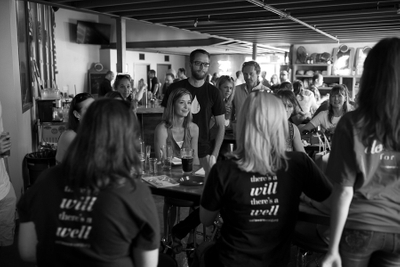 We will be closing out the final stretch of Shower Strike week with drinks, food, prizes & lots of impact. 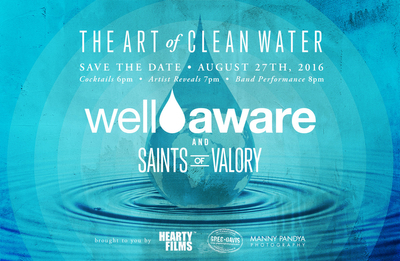 Well Aware is excited to partner with the Artist Couple for a unique World Water Day celebration! 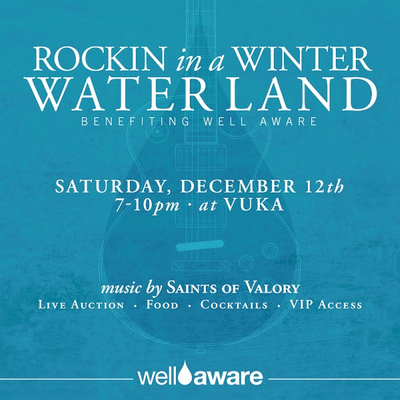 This one-of-a-kind Village event will showcase a variety of works by Austin-area artists, each donating a percentage of proceeds to our clean water projects. Are you ready to rock for a good cause? 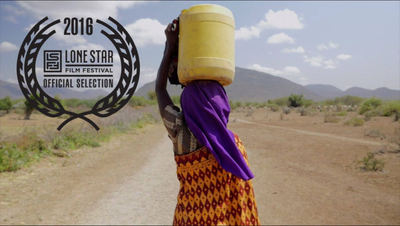 To date, Well Aware has implemented 55 clean water projects with a 100% success rate - transforming more than 245,000 lives in East Africa. And, this year has been one of our best years yet! 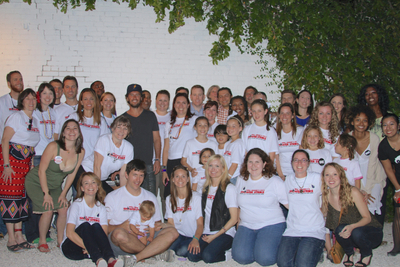 So, we want to celebrate the impact our inspiring and devoted community has affected with the best holiday party yet. 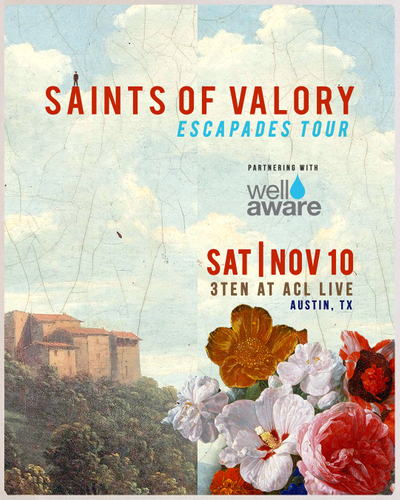 In partnership with Well Aware, Saints Of Valory will be LIVE at 3TEN ACL Live. 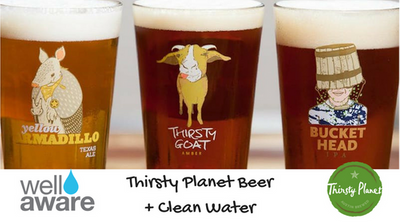 Join us for our fall happy hour at Thirsty Planet Brewing Company. New friends and old - come for complimentary beer and snacks, local pop-up shops and some awesome Austinites. 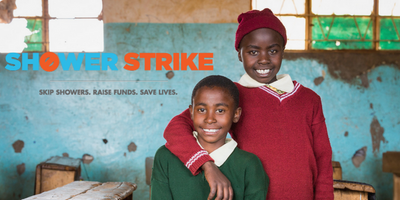 Join us on April 27th at the Highball to celebrate our 10th Annual Shower Strike and getting clean water to more than 85,000 people! We will be kicking off the final stretch of Shower Strike week with drinks, food, and door prizes. Come hang out with other stinkers or come donate to your favorite striker's campaign. Whether you're participating or supporting, we'd love to see you there! Join the Well Aware Village and Greg Davis - National Geographic Creative Photographer for a celebration of International Women's Day! Admission is free. 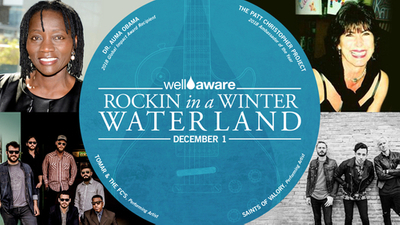 If you are interested in being a sponsor for this event, please contact Jessica Sager at jessica@wellawareworld.org. 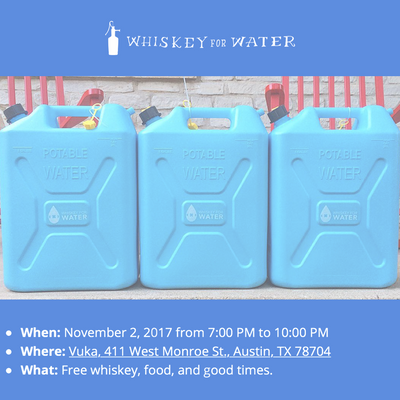 We hope you can join us for the Whiskey for Water 2017 Fall Classic on Thursday, November 2, 2017. Hayrides eat your heart out. 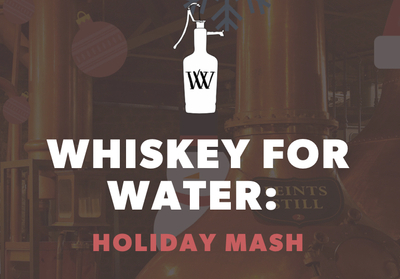 Leaves falling, wind blowing, and pumpkins already carved, Whiskey For Water is back. We are taking early November seriously and throwing one heck of a party. Join us for our Annual Well Aware Golf Tournament! 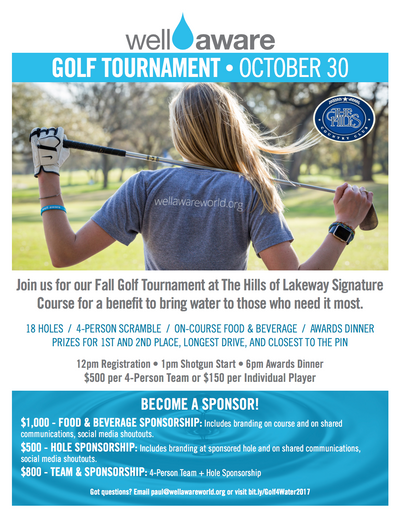 Being held at the beautiful Hills of Lakeway Golf Course- this will be a day you won't want to miss! You can sign up individually or with a team of up to four players. Contact us at info@wellawareworld.org for inquiries. Well Aware has been hard at work these past few months! We've expanded our work into Tanzania, built more life saving wells and water systems in Kenya, and most recently- we've worked with our partner Toyota, our amazing tech team, and local organizations to meet the clean water needs of those affected by Hurricane Harvey. And we want to share more exciting updates with you! 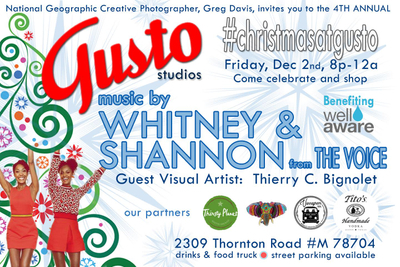 Fourth Annual Christmas at Gusto Studios! To be placed on the wait list, please email james@wellawareworld.org. Unfortunately, our Holiday Concert is sold out. We hope you will check out our other Holiday Giving Options! For questions, please contact Lisa at lisa@wellawareworld.org. Join us for our 7th annual Shower Strike Launch Party in April! Kung Fu Saloon has selected Well Aware at their charity for March. This is a fun and easy event; show up, enjoy a drink or two, play some old school games and they will donate 15% of our sales for that day to Well Aware. Join us to learn more about our upcoming Shower Strike and Shower Strike Kickoff Event. 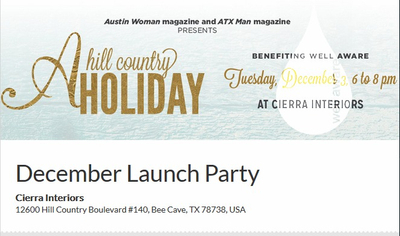 Well Aware co-founder and executive director, Sarah Evans, will be featured in the December issue of Austin Woman magazine. 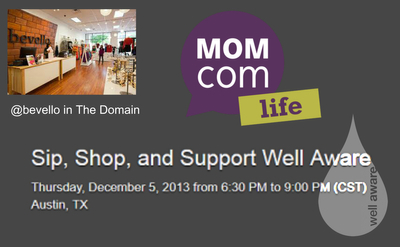 MOMcom is hosting Sip, Shop and Support at bevello in the Domain. Come do some holiday shopping while supporting Well Aware and enjoy drinks and light bites. RSVP here. 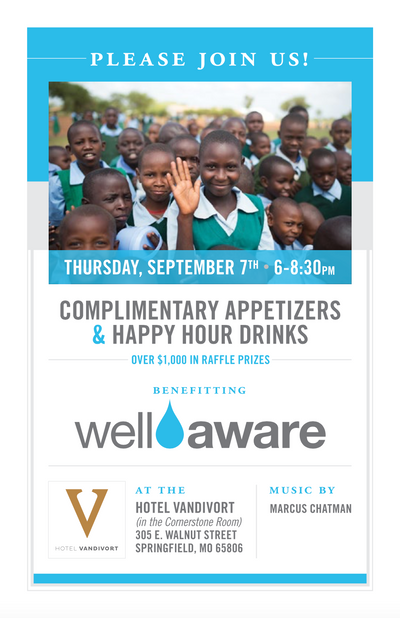 Come learn about Well Aware's mission while enjoying a percent-off of all PerriBerri merchandise! Bring the whole family for food and fun! 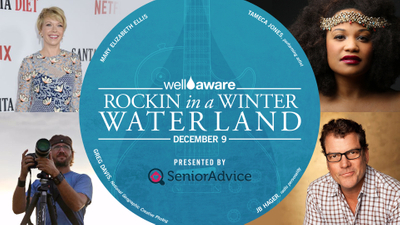 Support Well Aware and Austin High seniors Claire Kelsey (Well Aware Youth Ambassador), Anna Worrell and Julianna Beathard in their pursuit of global water access! Space is limited, so please RSVP here to be included on the guest list. We are well aware of what you have helped us accomplish this year. Let us thank you in style! To reserve your spot today, register here. Join our 7th annual Shower Strike campaign from anywhere on the globe, launching April 18th.